Christian Pulisic, born in 1998, is a promising American soccer player. The photo is from 2014, where he is at the age of 16. His grandfather Mate on the father's side is Croatian, born on the island of Olib. 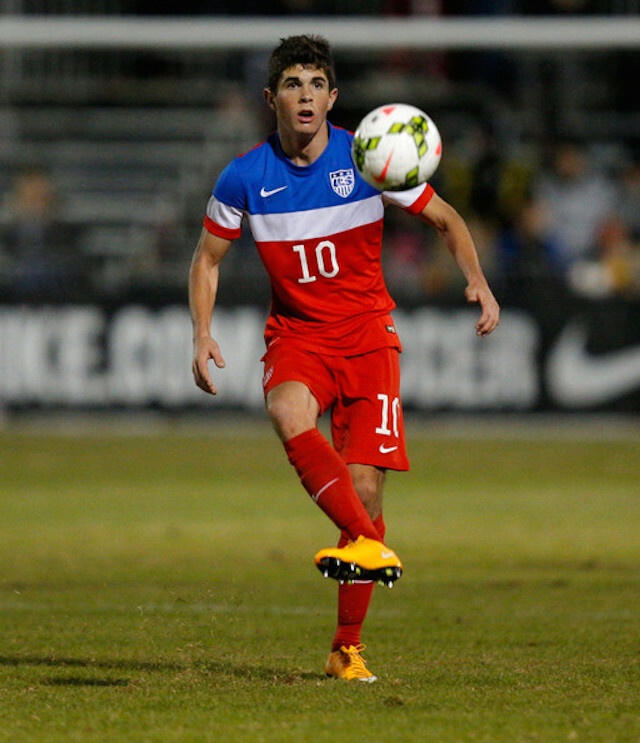 How was the next star of American soccer, Christian Pulisic, created? Christian Pulisic has the weight of a nation on his teenage shoulders. This was always the plan for the Hershey, Pennsylvania native, now just 18 years old and being hailed as the next great hope of American soccer by his coaches and teammates, plus pundits and fans. Working away in the foothills of the Appalachian mountain range in central Pennsylvania, Pulisic grew up with an incessant hunger to achieve. He would often take his training and games seriously, very seriously, but he was guided by a close-knit group of soccer experts and enthusiasts who led him on the path to greatness. His parents Mark and Kelley were both standout players at George Mason University, while Mark went on to be a star for indoor soccer team the Harrisburg Heat. Along the way he met Steve Klein and Bob Lilley, two former pros and now coaches who would help form a tight knit unit to help nurture Pulisic’s prodigious talent. Still, his rapid ascension has stunned everyone. Even those closest to him who knew of his special ability from a young age. At the age of 15 Pulisic was spending training stints with Barcelona, Arsenal, Chelsea, Porto, PSV Eindhoven, Villarreal and Borussia Dortmund. He plumped for the latter as the scouts started to flock to watch him play after standing out as a 15-year-old in the U.S. U17 side which beat Brazil in the prestigious Nike International Friendlies tournament in December 2013. Dortmund watched him again in a tournament in Turkey a few months later and the rest is history. Pulisic’s story gives thousands of others hope that the USA can indeed become a breeding ground for talented, creative players capable of performing on the biggest stages on the planet, as he has done in the Bundesliga and UEFA Champions League with Dortmund as a starter this season. He is 18. Ahead of the huge 2018 World Cup qualifier against Mexico on Friday, he is ready to rise as the next star of the USMNT and is expected to start for Jurgen Klinsmann’s side. As far as the U.S. soccer community is concerned: this is Christian Pulisic’s world and we are all just living in it. What goes in to making a superstar, international caliber soccer player? It is the question which has baffled the American soccer system for decades. In Pulisic’s case it was lots of hours of training. But not too much. Does that go against everything you’ve ever heard? Probably. At the age of 10, 11 and 12 he was getting offers from all over the place to play in three or four travel teams but his close circle of father figures steered him in the right direction. Train more and play less was the simple mantra. The Pennsylvanian Classics, a highly respected youth team Pulisic played for from the age of 10-15, agreed with these principles. Steve Klein is the director of coaching with the PA Classics and a close family friend of the Pulisic’s. Klein knew Christian from the age of four and he believes one of the key things for youngsters growing up and playing the game in the U.S. is to play for less teams. “From the age of 6-9, he was playing other sports. The family weren’t just all soccer. There was never a situation where it was just one sport and that was it. But definitely at a young age, he loved soccer the most and I know he would play on his own in the back yard with his dad. He was always playing,” Klein told ProSoccerTalk. “The one thing I would say for sure about his dad, mom and the family, he never played for multiple soccer teams. A lot of these kids, and this is something we struggled with at our soccer club a lot of times, kids just want to play so much, so many games and guest for so many teams. They never did that. Did that lack of playing games help Pulisic develop his sublime first touch, passing and dribbling skills? Pulisic wasn’t along for the ride. He would spend hours in his backyard, practicing drills and skills rather than endless running around and chasing the ball in a crowd of other players. In the same way golfers spend hours on chips and putting rather than trudging around a course, Pulisic was honing his first touch, his Cruyff turn and his dribbling. It sounds simple, but the truth is far too many kids are pushed into the “play, play, play” mantra by parents and their coaches at a young age. Klein, he was also an assistant coach for the U.S. youth U14 side, always had the feeling there was something special about Pulisic. Even though he was always one of the smallest players on the pitch. Those natural instincts have been nurtured expertly at PA Classics, within the U.S. youth national team setup and now at Dortmund since Pulisic moved to Germany at the age of 15. Jurgen Klinsmann, the head coach of the U.S. national team, revealed his delight about Pulisic’s development and onward potential.